The Prompting Theater consists of 24 core actors with developmental disabilities. Founded in 1995 by local actor and DSC employee Brian Hagy, The Prompting Theater began as an acting class for seven individuals who were interested in learning the basics of acting. After several months of exploring techniques and concepts, the group requested to showcase their skills in their first performance, Peter and the Wolf. The name “Prompting Theater” refers to the continuous exploration of prompting techniques provided for the actors as needed. Early approaches included lines being said offstage, and evolved to include less prominent means, such as using radio headsets, pictures, and even subtitling. The troupe has also explored various forms of theater, including comedy, drama, physical theater, dance, musical, and even miming and clowning. The mission and motto of the Prompting Theater captures the essence of the troupe: a disability does not imply an inability. The troupe takes this concept and incorporates it into the world of theater, making theater accessible both on and off stage for each individual who wishes to participate. 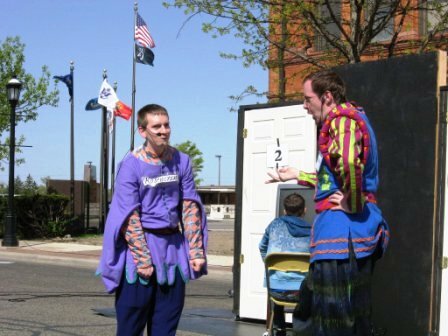 They strive to present different approaches to theater, opening new doors and ideas, and to provide a theatrical outlet for people with disabilities. •	To read more about the Prompting Theater, click here! •	Or click here for a video on the Prompting Theater! 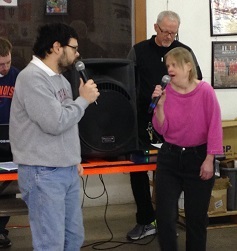 The Happy Rockers are a group of individuals served at DSC that enjoy singing and dancing and perform several karaoke-style concerts for fellow consumers and staff each year. Every performance has a theme, with the most recent performance featuring songs from the TV show, Glee! Each member of the Happy Rockers picks a song they wish to perform and deliver their rendition to an eager audience, backed with the support of their fellow band-mates. Audience participation is always welcome and I dare you to attend a Happy Rockers concert and not be tempted to sing along!